Today's Guest Bum, Chris Vail, is the owner and lead designer for Lew & Huey Watch Company (www.lewandhuey.com), based in Philadelphia, PA. Despite no background whatsoever in product design, or any design for that matter, he has pressed on to create five watches, the Riccardo, the Acionna, the Spectre, the Cerberus and the Orthos, with another model to be revealed soon. People seem to like ‘em, and so far they’ve all sold well, so while he may be another bum, he’s not a complete idiot when it comes this stuff. There’s an accountant in Vancouver, Canada named John Lee. He’s married, with a family. He probably drives a minivan and attends PTA meetings. Maybe he does your taxes for you. John’s the guy next door, a safe choice to sit on the local school board. But there’s this other guy, Johnny Lee, and he’s a bit of a wild child. He’s the guy who designed a PAM-esque watch with a grooved dial, racing stripes, and a tattoo logo – inspired by a similar one on the back of a stripper he dated. You might want to sit in on one of those school board meetings to see what textbooks he’s recommending – ‘cause they’re the same guy. Yes, I own my own watch brand, but I also collect watches. Yes, if John’s launching his own brand, he’ll be my “competitor”, but the truth is I’m friendly with a good number of my competitors. I like to own and wear the watches they design. As a typical watch-nerd, I like to analyze the new additions to my collection with all the intense scrutiny of a zoologist cataloguing some previously undiscovered species. I found the Cobra de Calibre on Kickstarter. 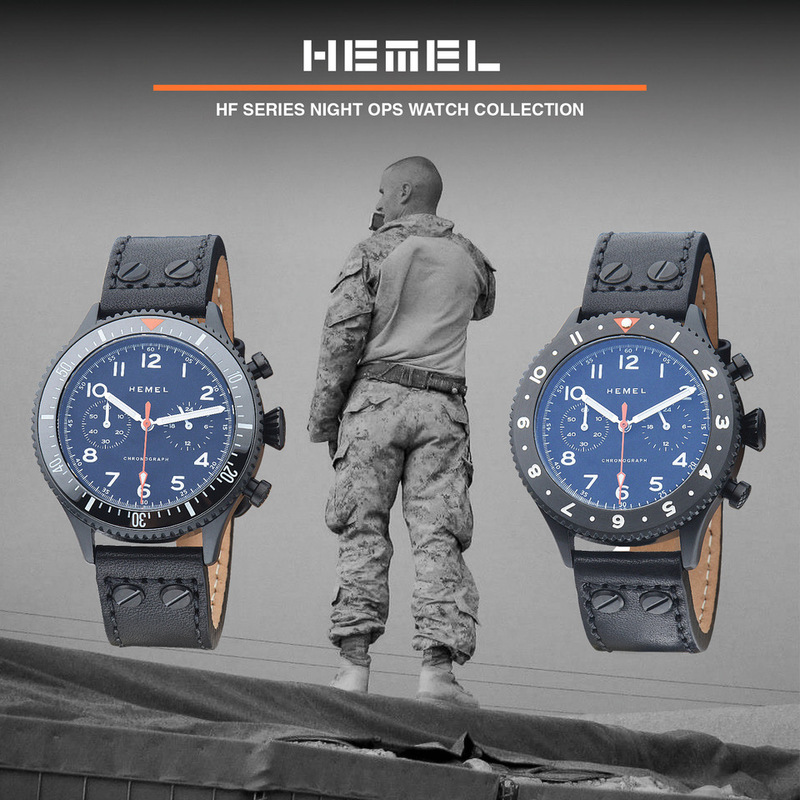 I was just doing what I frequently do, checking out other watch projects to see what’s hot, and what I’m up against. The Cobra stopped me in my tracks, gave me that gooey feeling inside, that “I want” feeling. In this case it was also combined with the jealous feeling of wishing I had been the designer. I immediately backed the project for one of the no-date, no-racing-stripe versions, reached out to John to introduce myself and wish him luck, went online to blather about the Cobra to anyone who would listen, and then proceeded to wait for my watch to be made and delivered to me. It felt like an eternity, but it arrived last week, and I have to say it was worth the wait. 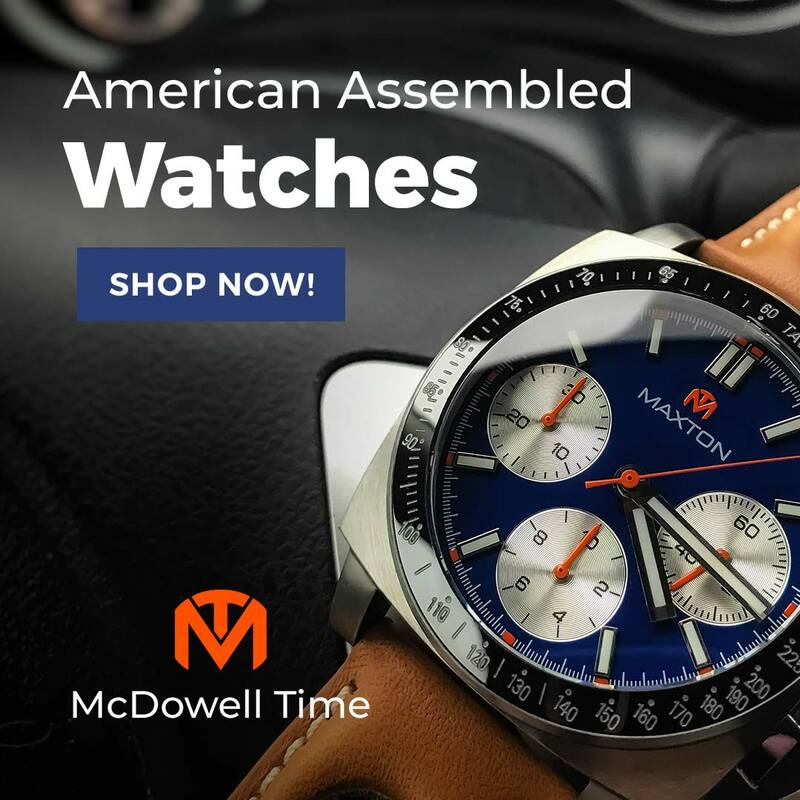 Overall it’s a phenomenal watch, especially considering its price – I paid CAD $409 including shipping to the US on Kickstarter, which equals about USD $375. It’s now USD $525 on his website, www.purplesushi.com, for either the date or no-date version (the racing stripe versions are sold out). Kickstarter backers also received a set of shield-shaped cufflinks with the Cobra’s logo, and an extra strap. I love it, and I’ll tell you why in a moment. I’ll also tell you up front that I’m going to nitpick it a little, because that’s what we watch-nerds do, we pick nits with watches, and find things to complain about, things most people wouldn’t notice. My complaints are very small and very few. Aside from them, it’s just an outstanding watch, and an outstanding first effort from John, the first of many to come, we should all hope. The Cobra comes in a leather bound, zippered travel case, emblazoned with the same cobra-wrapped-around-an-anchor logo. In the same stylized script font as the dial it reads, “Presenting: Cobra de Calibre by Johnny Jae Yong Lee”, showing John’s flair for the dramatic - just like the “Coming Soon!” promotional pics of the watch he had done up to look like movie posters. The case has room for one watch and an inner pouch, I guess for an extra strap and spring bar tool. For me, it’s yet another nice box that ends up in the cabinet above my desk. I’m happy he didn’t over-spend trying to impress me with a mahogany presentation box, jacking the retail price up another fifty bucks in the effort. Inside the case was the watch (duh), on its stock 22mm black leather strap with white stitches and “Cobra de Calibre” etched into the Pre-V buckle. 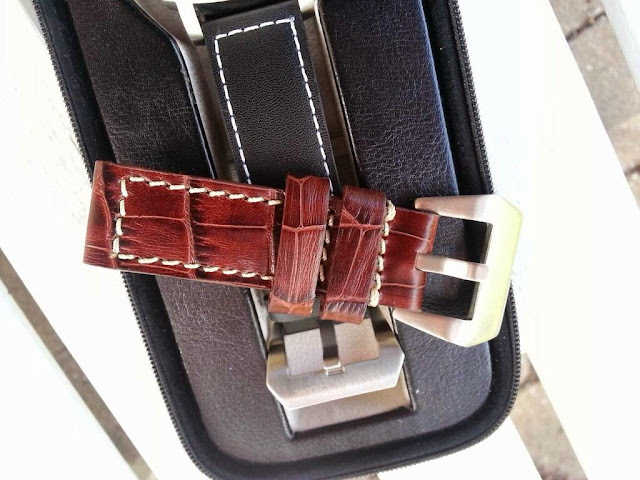 The strap seems reasonably well made, although it’s not going to “wow” anyone used to Horween leather. The underside is stamped with “Cobra de Calibre by Johnny J.Y. Lee”. 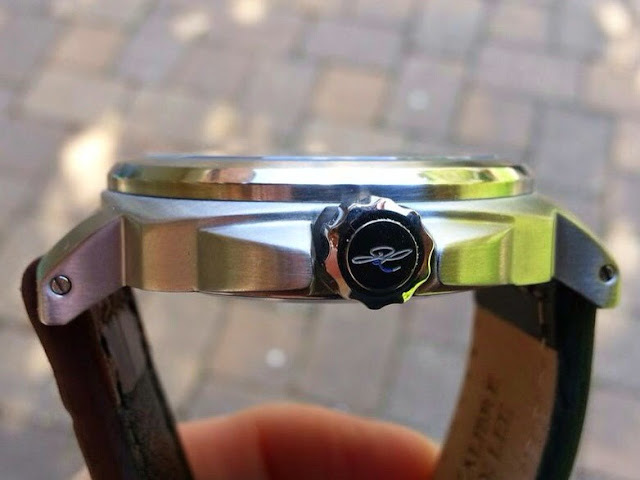 The signed buckle is a nice touch, but the font is your basic sans serif in all caps, which seemed slightly at odds with the rest of the watch and its tattoo script styling. Also inside the case was the extra strap, a nice looking brown leather with alligator texture. The brown strap seems a little nicer than the black, although neither the buckle nor the strap are signed. While I liked how the brown looked on the Cobra online, in person I don’t think it goes with the watch quite as well. Neither strap tapers at all, so those 22mm buckles can be somewhat bulky. Being 4mm, both straps are stiff at first. They would likely loosen up with wear, but a 22mm strap with no taper and a Pre-V buckle just isn’t comfortable for me, so I swapped out the stock strap in favor of an aftermarket piece. So the first little complaint – the strap. It’s good, just not comfortable for me personally. Straps are attached with solid-feeling one-piece screw-bars which thread into the lugs on one side. They feel solid, although I’d be paranoid about losing one if I changed straps frequently. Thankfully I have a few small screw drivers. If you don’t own any watchmakers tools, you may want to pick up a small driver set when you buy a Cobra. Another very minor nit. I recommended John order extra bars with future production runs, or just switch to spring bars with drilled lugs. Problem solved. The watch makes an immediate impression. A lot of people do NOT love the logo or the font used on the dial, and many think the logo is too big. 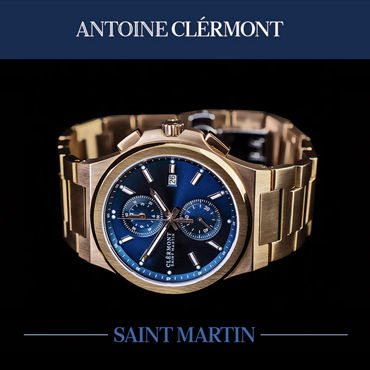 The logo and font are bold, make no mistake, but it’s a muscular, bold watch with a bold look about it. This is a “love it or hate it” design, no doubt. The case has the rounded-square shape familiar to Panerai fans, but the Cobra is smaller and thinner - 43mm wide with a 42mm bezel, a 51.5mm height (lug-to-lug) and only a 12mm thickness with the flat sapphire crystal. Adding to the impression of thinness are the not-too-tall case walls – only 6.7mm. The style may be bold, but the size is more Floyd Mayweather than Sly Stallone. My wrist is a relatively flat 7” around; the 51.5mm lug length is about as long as I can go before the lugs overhang my wrist. The case has a mix of finishes, all well done, with vertical brushing between the lugs and horizontal brushing on the sides. The bezel looks like a single curved surface in pictures, but it’s actually three surfaces whose slopes and angles combine to look that way. The broad, gently sloping top surface is brushed. The more steeply-angled middle surface and vertical sides are both thinner than the top surface, and polished. Getting a combination finish to look right can be tricky, but the Cobra nails it by being 90% brushed and 10% polished. The Cobra’s dial is 35mm wide, with vertical grooves in the style of the Omega Aqua Terra, applied C3 hour markers with an elongated trapezoid shape, and of course, that tattoo logo and script, reading, “Cobra de Calibre – Automatic – 30 ATM”. The dial is gorgeous, but if there was one thing I’d change, I’d make the markers just a little bit thicker. You can tell they’re applied, but they’re just a little thin. Again, a small nit to pick, but there you go. The hands are of John’s own design. They’re beautiful and unique – a broad, stubby arrow for the hour hand, a broad sword for the minute hand. 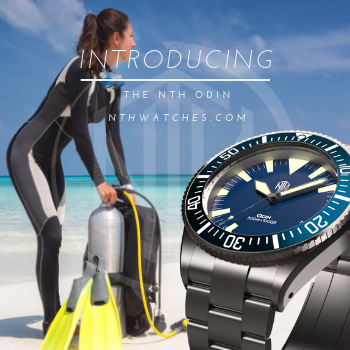 The seconds hand has a lumed arrow tip, with an open circle as a counterweight, reminiscent of the loop on a fishhook, perhaps echoing the nautical theme of the anchor in the logo. I asked John, and he said it was just a circle. He thought about filling it with lume, but liked it better empty, so there. The hands and markers are all stainless steel with C3 lume, but in certain light and at certain angles, the hands almost look gold, especially the seconds hand. Very cool. I wouldn’t have complained if the hour hand was a tad longer. It’s 10mm from the pinion to the tip, but I think it could be 11mm or 12mm without getting hung up on the hour markers (assuming they were taller) - another very minor nit. Out back, the Miyota high beat caliber 9015 movement comes nicely decorated from the factory, complete with Tokyo stripes, and a rotor that has a combination sunburst finish with sparkly nugget rim (I made that up, but that’s what it looks like - sparkly nuggets). 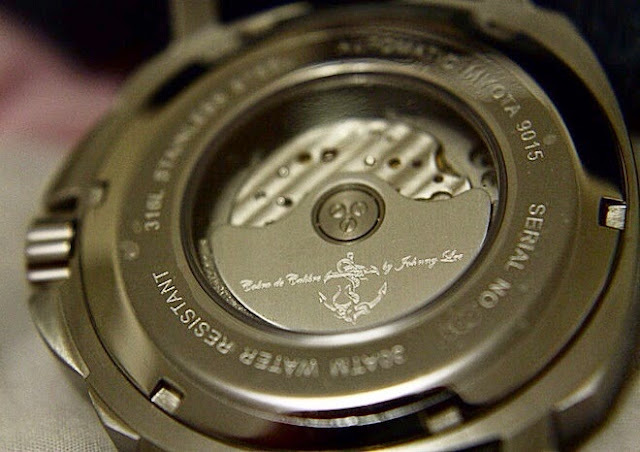 In this case, the rotor is engraved with the Cobra Anchor logo, perfectly centered, flanked by the script, “Cobra de Calibre – by Johnny Lee”. A nice touch, and shows again that John not only has a dashing sense of style, but high attention to detail. Being a 300m WR watch, the crown is of course a screw-down. It’s got a good size and texture, making it easy to unwind, pull out and manipulate. The crown bears John’s initials, “JL” in script. The Cobra’s hand-winding action is smooth, although perhaps a tad louder than other watches with the 9015, and with more vibration coming through the crown. This could very well be from the crown stem assembly. In position two, there’s no perceptible clicking when the date is advanced, a commendable trait when the dial lacks a date window. Feeling that ‘click’ as the date advances, and not being able to see it can drive some watch nuts, well, nuts. I noticed the rotor was fairly audible – not loud enough to call it loud, but loud enough that I noticed it, if that makes sense. I compared it to another watch I have with the 9015 and a transparent back – about the same sound in both, neither loud enough to be heard while on the wrist and walking around in “normal” conditions. Comparisons to Panerai models are inevitable given the case shape, but there’s not much they have in common beyond the basic silhouette. It’s ironic that Panerai started out as a military diving watch, yet I can’t imagine many in the military could afford one, or that anyone would actually dive with one. I think the typical Navy Seal would find the Cobra suits them much better. 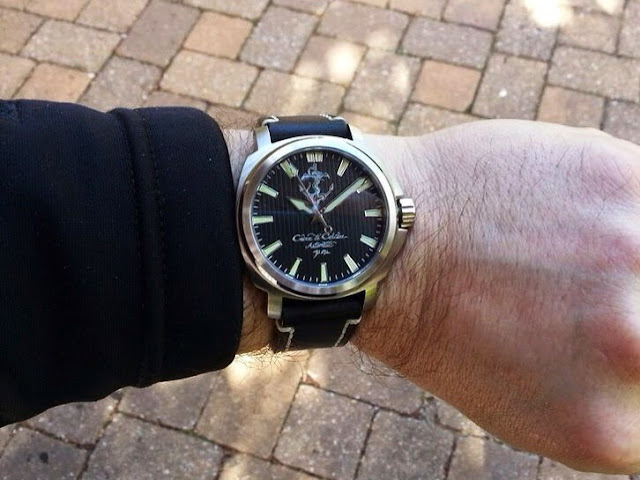 Even with the anchor tattoo logo, the Cobra is actually the less conspicuous watch, and in my opinion, better looking and just “classier” all around. So, what have we got? 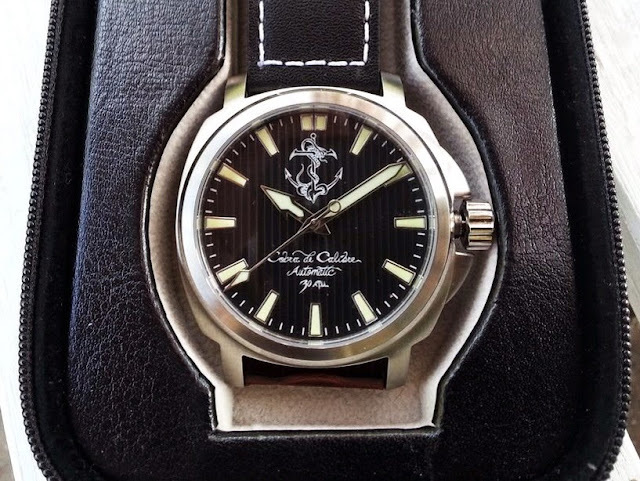 Well, I got a gorgeous, stylish, well-made, bold-yet-classy watch with an incredibly reliable and accurate high-beat Miyota 9015 movement, engraved rotor, antireflective sapphire crystal, 30 ATM water resistance, two pretty decent straps and a nice set of cufflinks, delivered in a handy zippered travel case, all for about $375. If you missed out on the Kickstarter project, you can get all that minus the extra strap and cufflinks from his site for $525, and it’s still a pretty good bargain at that. All in all, I’m very impressed with it, even with my small handful of very petty complaints. It’s a tremendous first effort from someone I hope will give up doing people’s taxes and start designing watches full time. I like Johnny Lee the wild-child watch designer better than John Lee the respectable accountant, and I love his watch. Pros: Scaled-down Panerai shape, but with a bold, unique style all its own. Phenomenal value. Cons: Stiff strap. The style makes me want to hang around bad people and do bad things. Sum-up: A shot of adrenaline which a whisky chaser from the least likely source imaginable. This guest bum approves. I can’t wait to see what Johnny comes up with next, and I suggest you get over to Purplesushi.com before they sell out.